Sometimes it can feel hard to dress well casually. The secret to looking great, even in denim and a sweatshirt, is introducing intention in the colors of leather we use as details. This post is in partnership with MVMT watches. 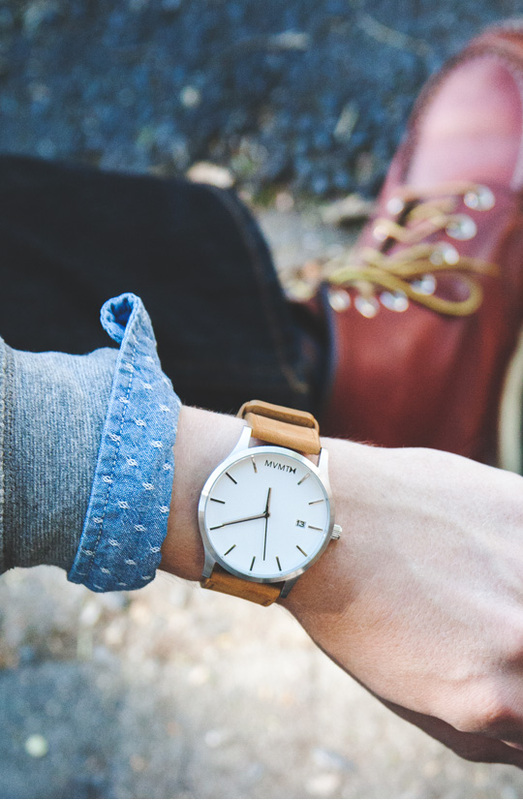 Affordable, minimalist timepieces with a 2 year warranty. Learn more here. I like the outfit in theory, and the details are great but I always have a problem wearing a sweater over a button down. I end up looking boxy, like this guy in the pictures. These outfits are a huge help to people (like me) that have a tough time putting outfits together, picking specific clothing pieces, etc. Thanks for all your work on these Get-Ups! So happy you enjoy them, really appreciate the feedback! I really do like the classic and sportive look! Although I’m a women and I’m a journalist myself (but as US correspondent for European car magazines), I simply love Primer. Your articles and newsletters always give me the perfect break during a busy work day! Thx for the great work! Cheers from San Diego, p.
Hadn’t thought of that, but you’re right! 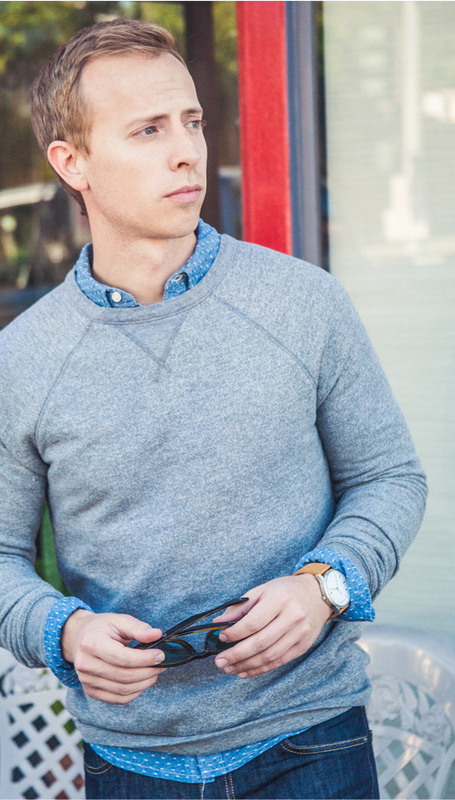 Have you tried v-necks or quarter zips/buttons? The V and or the collar on the and subsequent V will visually elongate you. Shawl collars and cardigans will do the same. Long time readers are annoyed with my love for shawl collar sweaters. 🙂 The crew was an intentional choice for a more casual look. Haha ohhhh, got it, makes sense! Good tips. What size is the sweater? It looks like it may run small based on the reviews on the Uniqlo website. I typically wear a medium but am worried it may be too small. Why post a quality getup to be hindered with terrible shades? C’mon. Invest in a quality pair. They make the world of a difference. First, great username. I love these shades, amazing price for polarized and they look great too. I did an article on them awhile ago and people loved them. What does Primer use for it’s “click for more information?” is it a plugin, or do you style it yourselves? I’ve been looking at MVMT Watches for a while, but have not purchased one yet. I have small wrists, and a lot of watches look too large on me. 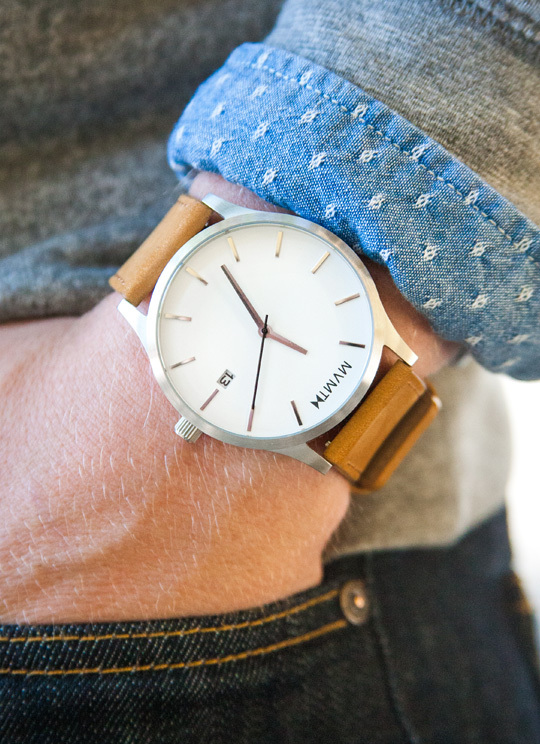 The watch fits you well. What is your wrist measurement? Also, thanks for the 10% hookup. You’re very welcome! It looks like my wrists are just over 6.5″ around. I love everything in this outfit but the watch. One of the investments I wish I had made when I was younger was in a good watch. I’m thinking along the lines of an Omega Seamaster, Rolex, Tudor. any reason you went with the Red Wing moc toe boots instead of the Thorogood ones from last season’s “Fall boot special”? Hi Lorne, they’re different colors, but the Thorogoods would work great too. Quick Question… Did you tailor your DSTLD jeans? I noticed in a previous post that you wear a 30X30 in CombatGent Chinos, so do I. However, my DSTLD jeans seem much longer than the ones in the photo. Hey Mike! Nope, my dstlds are off the rack. Are yours the slim straight? Negative… i purchased the straight style. Seems like they would be the same length regardless. Ill give the slim straight a shot. Great outfit. 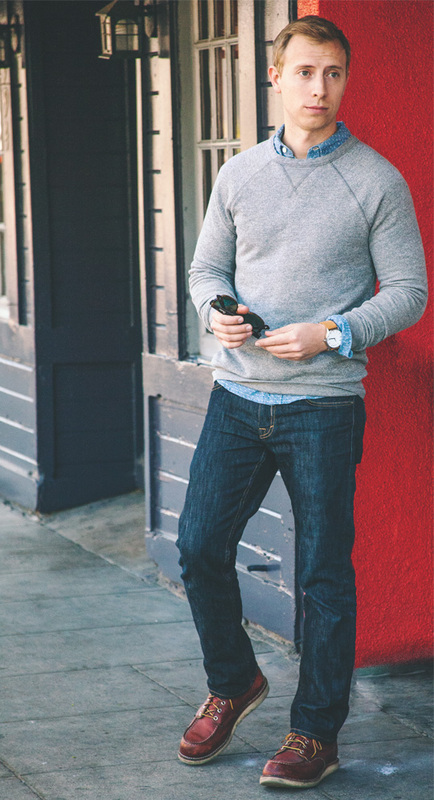 Big fan of the “french terry-like,” style of the grey crew in place of a simple grey v-neck sweater. I think this crew gives a little versatility to the outfit so you don’t always have to throw on a cardigan or a v-neck sweater. I like how the jeans fall on your frame. I have a very small seat and narrow legs and have been having my dark jeans tailored to fit my frame better but i still end up have a little boxier look in the front hip and crotch of the jeans? Any suggestions on how to alter these so they drape better on my frame? Maybe take in the seat a little more? Any help would be appreciated. DSTLD also has a skinny jean, have you had any luck with going that route? 3.) slim or form fitting. And i’m struggling to find those perfect pairs that will go with everything. You could also stop by a Levi’s store or a Macy’s. Levi’s has a ton of different fits now, you may be able to find one that works with your shape. Have you tried the 511? I have tried Levi’s, I use to wear 527’s before i got tired of the bootcut. I have tried the 514, 513, and 511 and they all are too boxy and baggy in the seat and thigh except for the 511 slim which seems to fit more like a skinny jean. I have since been greatly disappointed with the inconsistency in the fit of most Levi products. I wish that my thighs and seat were more of an average size so off the rack jeans would fit me more consistently. I’m getting more afraid that I will have to have my jeans tailored from here on out and that is gonna hurt the budget a little bit. Haha thanks! Let me know how it goes, they’re my favorite pair. Will do and thanks for replying! A note from what Ross mentioned with the jeans fit. Would you say that these jeans fit slim in the seat compared to Levi’s? I’d say they’re slim in the seat without being too tight. The reason I love them so much is because they’re slim all over but I can still wear them with boots without making the boots look too clunky. That’s great Andrew and is what I was hoping. I don’t like baggy fitting jeans at all!! You’ve made this very interesting. Thanks for the interaction. It makes a difference! Shawls are very nice. I agree with you on that but I do enjoy the change that Andrew made with this outfit and going with a “French Terry-looking type Crew Sweatshirt” over the top of the oxford. Gives the outfit a casual spin to a somewhat semi casual/casual office attire. It’s just the difference in preferences. I don’t care much for crew neck. So I will use other options to compliment my style.